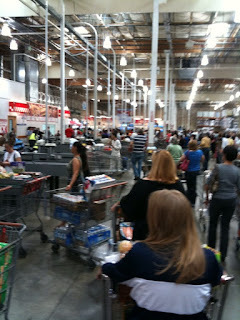 Don't ever go to Costco on Saturday afternoon again. Ever. I thought Costco serves the best/most samples on Saturday afternoons. Sandy and I call it "Sample Saturday"
Good point. Maybe I should amend my note to "Don't ever buy anything at Costco on Saturday afternoon again. Ever." Maybe you should just skip the Costco trip altogether on Saturdays...no matter what time of day it is. Stacy calls them "Crazy Costco Saturdays." ...If that tells you anything.